Back in the 1980s and 1990s, Japan was a major player in the sports car business, slicing through international competition at half the price. It was this era that gave birth (or rebirth, for some) to a handful of iconic models, such as the Skyline GT-R, Supra, 300ZX and RX-7. It was also at this point in time that Honda decided to go one level up and target the elite European market. Using state-of-the-art technologies and engineering innovations derived from their F1 program, Honda came up with a proper world-class Ferrari competitor, with the practicality of an Accord. It was said to be the best-handling sports car of its time by many journalists and testers. The Type- R variant had most of its luxuries removed in favour of performance enhancements, such as a tuned 3.0 litre V6 engine, stiffer suspension and a 120kg weight reduction. 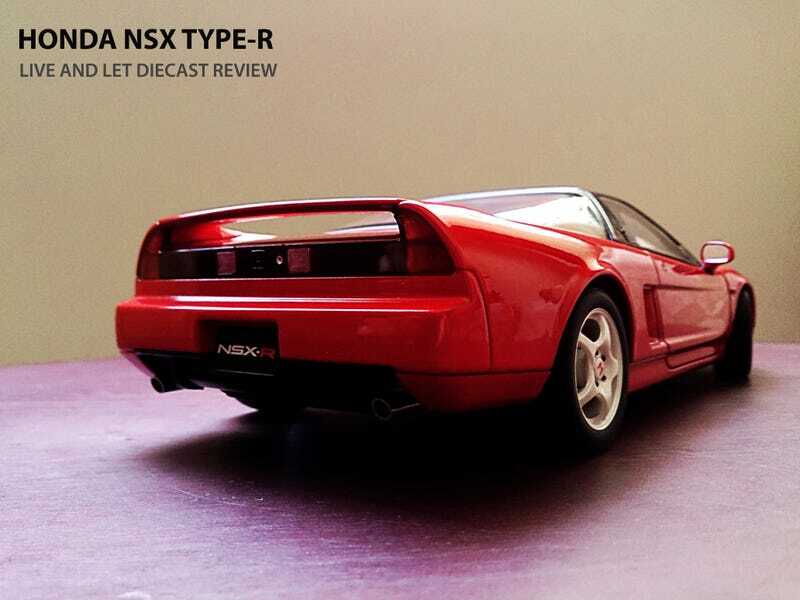 Under review today is a 1/18 scale representation of the Honda NSX Type-R, built by AUTOart. The first thing that grabs your attention is the Formula Red paint, which contrasts well with the glossy black cockpit. Paint is smooth and consistent throughout the entire car, and there are no signs of under/over-spray. The proportions of this NSX are dead-on, unlike Kyosho's rendition. At the front, a photo-etched red Honda badge is present on the nose. It is a small indication that this is no ordinary NSX. The signal lights are surprisingly well-made, and no mounting posts can be seen. The same goes for the pop-up headlights. They are so well-made, one could mistaken it for the real deal at first glance. The texturing and patterns are identical to the ones on the real car, as they should be. All grilles are perforated, a good sign that this is a no-compromise model. Like many other supercars, the NSX possesses a low-slung and aerodynamic shape. Fun fact: the actual car's drag co-efficient is recorded at 0.32. From this view, we can see various little details that truly make this model an outstanding one. A detailed matte silver painted keyhole, small photo-etched NSX badges near the door handles on the B-pillar, and a signal indicator are just the tip of the iceberg. The wheels are painted in white, with a slight pearlescent effect. It even has individually painted lug nuts. The brake discs are metal, complete with black calipers. The tyres are beefy, complete with realistic thread patterns. The fully carpeted interior is so realistic, I had to do a double take. The special MOMO steering wheel for the NSX Type R is present, and it looks absolutely gorgeous. The dashboard and centre console are also filled to the brim with details, painted to look identical to the real one. I was amazed to see a highly detailed recreation of the key hole next to the steering wheel. The gear knob is painted silver, to mimic the aluminium one found in the actual car. One thing I am slightly annoyed is that the molding on it can be seen, dividing right through the middle. This is, however, a small niggle, and I may be over-reacting. The red Recaro seats have an alcantara-like finish, and feel good to the touch. Fabric seat belts are also attached to them, pushing the level of realism from good to great. The rear part of the seats are painted in a nice blend of black and yellow, recreating the yellow carbon fibre patterns of the real one. The metal NSX-R door sills are excellent. Opening the engine canopy is tricky business. It uses friction struts that are extremely delicate and flimsy. They are, however, pleasing to the eye. Another form of eye candy is the engine cover. It has a rigid yet fine mesh pattern, enabling us to have a sneak peek of the 3-litre V6 DOHC V-TEC engine. It is far easier to lift the cover open, and it feels much sturdier as well. Once opened, we can see the engine in all of its V6 glory. There is so much to take in here. The main engine block is compromised of several pieces, painted in black and satin chrome. Separate wirings can be seen all around. Many OEM stickers fill up the engine bay, to ensure authenticity. Brilliant. The boot is carpeted, like the rest of the interior. The rear is just as beautiful as the rest of the car. Chrome exhaust pipes, highly detailed tail lights and a blacked-out Honda badge at the centre can be seen. The bonnet of the NSX-R can be opened, complete with a realistic metal rod holding it up. As this is the Type R variant, there is no spare wheel to be found here. However, you do get to see various mechanical components and even the battery unit. All very fancy. Again, there are many OEM stickers to be found here. And when looked at through a magnifying glass, they are actually legible! Turned turtle, the NSX-R reveals a whole new world of details. The base is metal, colour in sync with the main body. Intricate suspension bits and engine pieces are clearly represented. It is easy to get lost in this sea of fine details. A close up shot of the rear. Truly amazing. All in all, this is one model you should not miss. It is by far one of AUTOart's best efforts. This is as close as it gets to having an actual NSX Type R NA1 in your home.